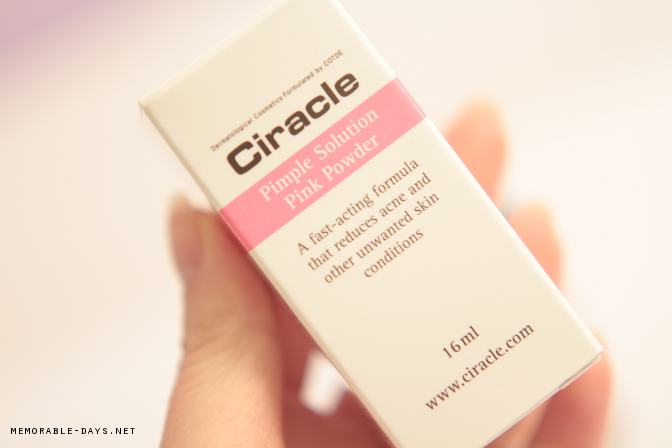 Review: Ciracle Pimple Solution Pink Powder | Memorable Days : Beauty Blog - Korean Beauty, European, American Product Reviews. OMG, GIRLS! This is such an awesome product and it's also my holy grail product at the moment! 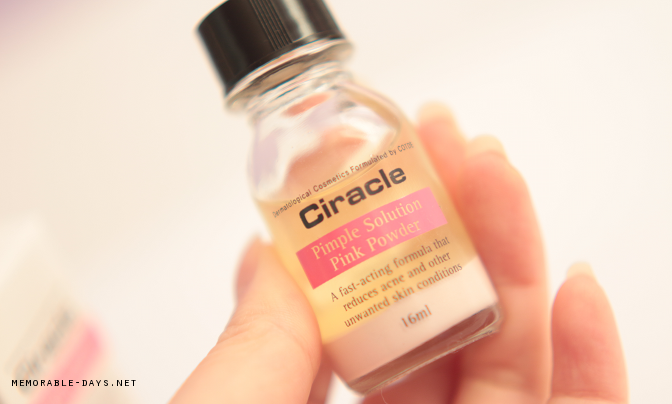 I have never seen a product like this before, I'm talking about the pimple solution pink powder of the Korean brand Ciracle from Wishtrend.com. The name says it all, it's a cure for your pimples! I heard lots of positive things about this product before from beauty bloggers, but this time I tried it myself and i'm very happy that I did since it's a great product! No need to squeeze my pimples ever again because I have this now. Continue with reading if you want to know more. 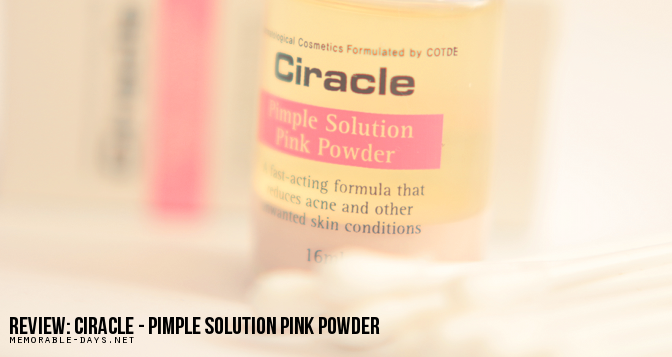 The pink powder from Ciracle is a fast-acting formula that reduces acne or pimples. It contains effective ingredients (such as sulphur and salicylic acid) to soothe, relieve and reduce present acne or pimples and future scars. Well I have to admit that I hate to see a white spot on my pimples, i always squeeze it because it will look less grose. However, we all know that it will leave a scar afterwards :(. I'm so happy that I tried this pink powder since I don't need to worry about squeezing it and i'm not getting any scars anymore! WOHOE! AWESOME! This was sent to me from Wishtrend.com and it's sold for $22.99 there (link to product). It has 16ml of product in it. I know that it's a bit expensive for such a small bottle but hey... it really works, so I wouldn't even mind buying it. Also, you will only use one drop for 2-3 pimples so a little goes a long way (depends on how many pimples you have of course). When you are going to purchase for the first time you will be getting free shipping (without a minimum amount). They ship worldwide and feel free to use my coupon code: MEMORABLEDAYS to get 5% OFF! They ship from South Korea and it took around 2-3 weeks until it arrived here in The Netherlands. I didn't have to pay for customs. For more information about shipping, go to my previous Wishtrend blogpost. It has a simple packaging - it is white and pink with Korean and English descriptions. As you can see in the picture below there is pink powder at the bottom of the bottle and I think that the yellow part is alcohol. It doesn't matter if you accidentally shake it, just wait 2-3 minutes and the pink powder will sink to the bottom, so you can still use it afterwards. 1. Use the pink pimple solution after cleaning your face before you're going to sleep. 2. Grap one cotton swab, dip it in and pick up the pink powder. 3. Pat smoothly *pat pat pat* on your pimple, acne, and trouble spots and it will soothe the area. 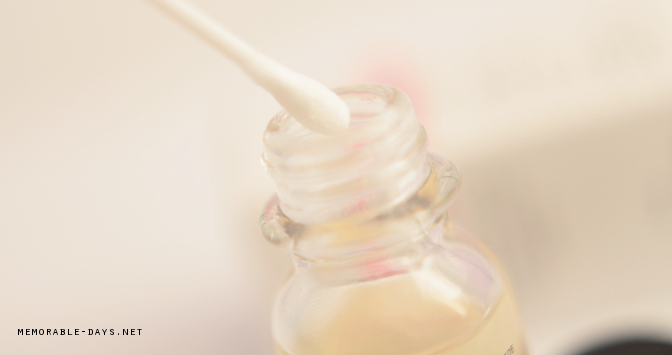 Don't re-dip a cotton swab in the bottle because of hygienic reasons. Use the other side of your cotton swab or grab a new one and dip it in again if needed. 4. Clean your pink spots in the next morning. It has a strong scent of alcohol. There is no way that you can't smell that haha. However, I don't mind it at all. Since you won't notice the scent when it's on the pimple. You will only notice it when you twist the cap open and when you put your cotton swab in it. I've been breaking out on my neck because I used a new night creme. I suddenly had lots of pimples at my neck area and they were itchy as hell (OMG!). I was so happy that I was able to put this on my pimples. It stang a little bit when I applied it since it contains alcohol too. However, i directly noticed that it wasn't itchy anymore, it had a cooling effect and the pimples were dried up in a few minutes. The next day when i woke up I noticed that the redness was reduced and the size of the pimple was smaller. HOW AWESOME?! I kept using it at night for a few days and my pimple is almost gone now o.o! How amazing is that? It really does what it claims! Would I purchase it? DEFINITELY! I would definitely purchase this again and again. The product became my holy grail and i'm really not kidding. It really does what it claims. People who are often reading my reviews know that i'm honest with my opinion even though it's a sponsored product. And i gotta say, this product is just awesome o.o! I was so amazed that the pimples were reduced within a day! If you are interested, make sure to visit wishtrend.com. When you are going to purchase for the first time you will be getting free shipping (without a minimum amount). They ship worldwide and feel free to use my coupon code: MEMORABLEDAYS to get 5% OFF! Leave a comment below if you've got any questions. note: this product was sent to me for review purposes. this blogpost contains affiliate links.